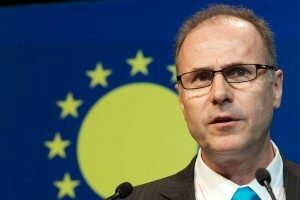 As chief scientist at Trina Solar – the world’s largest supplier of PV modules since 2014 – Pierre Verlinden is not necessarily best qualified to comment on the state of the Australian market. But as a PV researcher and developer of 17 years’ experience, who has watched the solar market grow 60,000-fold, and whose work over that time has directly contributed to falling costs and consistently improving generation efficiency – he knows where the technology is headed. “PV is the people’s choice of energy,” Verlinden told One Step Off The Grid in an interview on Friday from China, where Trina is based. “It’s a train that nobody can stop. “Solar with battery storage; you pretty much have a self-sufficient family business. It provides all the energy, including for the cars, if there is the incentive to do so. “The utilities also want PV,” he adds – they’re not stupid. It’s cheaper than almost any other source of energy. But they want to control it. For its part in driving this transformation, Trina shipped about 1.5GW of solar last year, and is producing it at a rate of 7GW a year. Other PV technologies that will be even more efficient are either in the lab or being tested in the field. Meanwhile, Trina has also begun offering its own line on battery storage, with residential and small commercial systems ranging from 7/12/15kWh, sold under the brand of Trina BEST. The lithium-ion, cabinet battery systems come with a hybrid inverter, which means they can work both as grid-connected systems, or without the grid – offering back-up power if the local network should happen to go down. But the key to the people’s energy revolution, according to Verlinden, is still cheap solar PV. “The advantage of PV is it is the most distributed source of energy, and we need to take advantage of that. 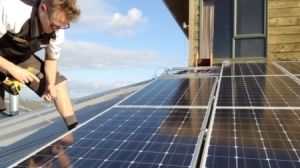 We need to put PV on every roof,” Verlinden told One Step. Australia – already a world leader in rooftop solar penetration – is tipped by many to follow the same path for battery storage uptake. And though the residential rooftop solar market has been a little bit quieter over the last few years, the key economic drivers of uptake – namely high electricity prices and falling solar costs – remain. 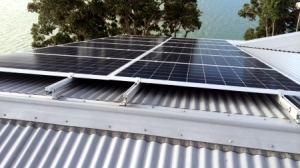 “(Australia’s residential solar market) still has room to grow… We’d love to see 100 per cent of houses with solar PV,” he said. At this point, Verlinden – who is a Belgian-born Australian – notes the example of San Francisco, where new legislation requires all new-build houses to have a PV system installed. “We should have this in Australia,” he said, “or at least (a law requiring new houses have) the capability to put PV in.